But don't take our word for it. Let our customers tell you why they've chosen us to be their Managed Security Services Provider. "I cannot say enough good things about this company..."
"We have been using Security7 for over 4 years now and I can confidently say they are the best in the business. They are always available to help when in crisis mode or low level issues. I have not run into one issue that they have not been able to provide prompt support for. They go above and beyond giving advice or support on each and every call I have made to them. I recommend them to any size business as they will find the right support for you. I manage the support of a school district including 5 buildings as well as a Town Hall with less than 50 users and the level of support is exceptional in both cases. I cannot say enough good things about this company and the people who run it and help support me. I am a customer for life!" "(Security7 Networks) provided us witha a secure environement that runs efficiently and effectively"
"At the Eagle Tribune Publishing Company we've been using Security7 to help manage and secure our network since 2011. Their expertise has provided us with a secure environment that runs efficiently and effectively. Security7 manages our 6 locations keeping the systems updated with the latest releases and helps us keep up with the ever changing challenges associated with network security. I would highly recommend their services." "Bob, Ray and the team are super responsive and have never let me down"
"Security7 Networks has been our IT service provider (partner) since 2009. We have had many issues such as upgrading our entire network, firewalls, virus, flooded computer room, etc... There has never been an issue they could not address for me. Bob, Ray and the team are super responsive and have never let me down. If you are looking for a competent partner, I would highly recommend you give them the opportunity to impress you like they impressed me." "We've been using Security7 Networks for a bit more than one year. We reached out to Security7 after we suffered from two different Ransomware attacks. They came in quickly to review our needs, and now manage our firewall and virus protection for about 45 workstations and three servers. Very reasonably priced for a small business, and with that being said, their continued support is outstanding. It's hard to find a company with their level of service these days. No matter how big or how small the issue, they always amaze with their performance. We couldn't be happier!" 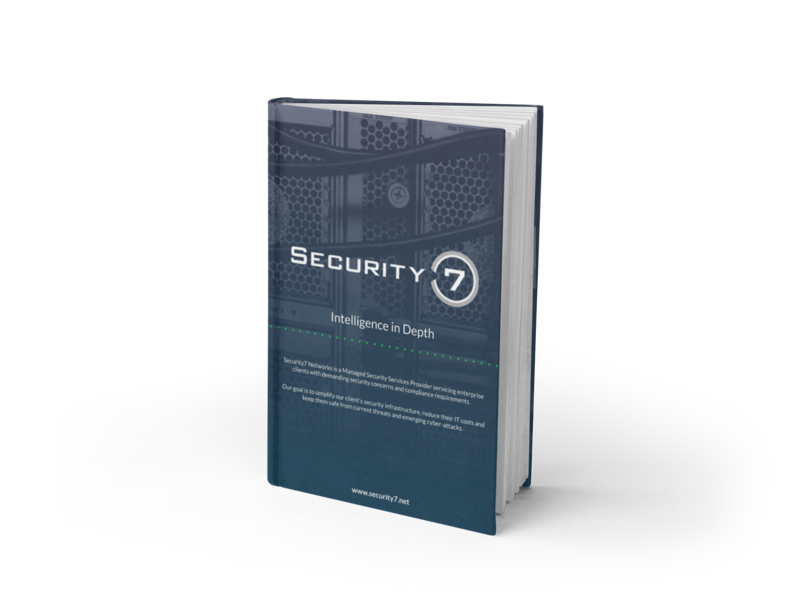 "Security7 is an amazing company! They manage our firewalls and monitor our network. They have incredible response time whenever we need their help. Their entire staff is extremely knowledgeable and polite. I would recommend this company to anyone!" "Security7 got our 18 branches up and running nearly seamlessly..."
"Knowledgeable, professional, proactive and AVAILABLE! We migrated from a network supplied and managed by a huge provider with so many departments and layers within departments it was near impossible to get things done. Security 7 got our 18 branches up and running nearly seamlessly and when issues arose, solutions were implemented immediately." "Been doing business 5+ years Great Company. They helped us setup and install our firewall. They monitor the firewalls and have alerted us to problems and provides support resolving issues. They have always responded to any problems within minutes and helped us resolve the issue." "Admiral Metals has been with Security7 Networks over 5 years now and service and support have been nothing short of exceptional! They manage and monitor our Firewall's WAN, VPN and Internet traffic at all our locations. We always know if there is an Internet/ISP outage or issue with one our sites ASAP as they alert us via phone, e-mail, text. We always get the best support in a timely manner and clear and concise communications from each member of the staff. Lastly, they are well versed in the latest security trends and keep up with training on the products/services they sell! GREAT Organization, PERIOD!" "We have been using Security7 Networks since 2015. We rely on them to provide the security services we need to run smoothly and efficiently in the is ever changing day and age of technology." "We've been using Security7 Networks for decades, and I wouldn't have it any other way. Great team there, and fantastic to work with!" "Very knowledgeable staff, fast reliable response, great customer service." "Awesome group of security professionals!"